Bring joy to your family, while helping bring joy to others. Join us for a special Mothers Day to remember while helping us assist families in dire financial need. 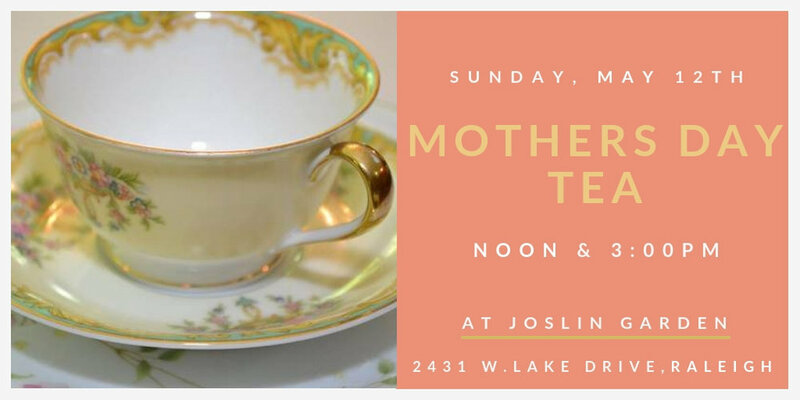 Honor your mother by treating her to high tea at the Joslin House, with its beautiful gardens and patios. We have two planned seatings, one at noon and one at three. Proceeds from the event will benefit a special charitable cause. A traditional afternoon tea party will be served indoors, with beautiful china table settings, charming tea sets, and delicious food. After tea, families may tour the beautiful gardens. You are welcome to photograph as many of your own memories as you like. This year's tea will be held in honor of the late Mary Coker Joslin, who donated the Joslin House and Joslin Garden to the City of Oaks Foundation. Her philanthropic heart and love of gardening and nature will be reflected at the event. Special treats may also be provided, compliments of the City of Oaks Foundation and our sponsors. All sales of this year's tickets will help children in local Raleigh homeless shelters to attend a week of summer camp through Raleigh’s Parks, Recreation & Cultural Resources and the City of Oaks Foundation’s Give Play Program. Tickets are limited and all participants must have a ticket in order to participate. This event has sold out each year it has been held, and additional tickets cannot be purchased at the door. We will have a waiting list available once all reserved seats are taken. We have lowered the minimum age for attendees to 6 years old and up. Tickets are $35 per guest. A full menu is not yet available. You will be able to find it on the City of Oaks Foundation's website, closer to the event, and posted here. Are there minimum age requirements for the tea? Yes. Because of the delicate china, there is a minimum age of 6 years old to participate. Where do I learn more about the charity? Please park on W. Lake Drive, on the side of the street opposite of the homes. No rking is permitted in front of the neighbors' homes or in the drive way. Please come to the Joslin House via the drive way or up one of the garden paths leading from W. Lake Drive. If a guest has limited mobility they may drive up to the house and be dropped off at the door, but no parking is permitted in the drive way. Please dress nicely to maintain the high tea atmosphere of the event. You may wish to bring or wear comfortable shoes for walking the garden paths and trails. Some areas of the garden may not be accessible to those with limited mobility. Cameras are welcome. Depending upon the weather, you may wish to bring sunglasses or a hat while walking in the garden. As space is very limited refunds will be offered up to 7 days in advance of the event. After that deadline, we are not able to offer any refunds. A list of all guests will be maintained by the host or hostess, but bringing your ticket will expedite your seating. Please call us at 919-996-4773 or email info@cityofoaksfoundation.org.